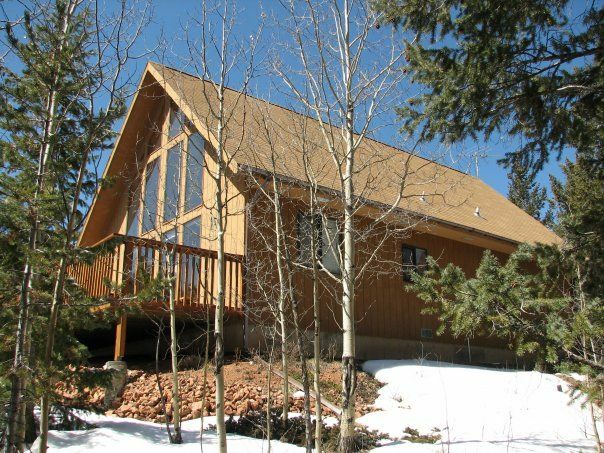 Beautiful Secluded Mountain Home with Stunning Views of Pike's Peak. You will have total privacy in our beautiful, secluded mountain home, yet conveniently located within a few short miles of several famous tourist attractions. Our 1 1/2 story, 1,280 sq. ft. cabin features rustic cedar exterior, newly decorated interior mountain lodge theme with all the amenities, passive solar windows with breathtaking mountain views, 3 bedrooms, 1 bath. Basic Satellite with new flat screen TV and a large selection of movies including many children's movies. We also have a large selection of books and games for the kids. Everything you need to enjoy your stay including electric stove, refrigerator, microwave, toaster, coffee pot, modern front loading washer/dryer, linens, dishes, silverware, cookware are all provided. All you need to bring is your food. We even provide a BBQ grill on the 350+ sq. ft.deck. Once in our cabin, you will find an extensive amount of Colorado information on attractions and even some discount coupons for various places of interest that you are welcome to use. The view from the deck is breathtaking. At night you can relax on the deck with a fabulous night time sky with the brightest stars you will ever see. At bedtime, sink into one of our comfy beds for a relaxing nights sleep. Enjoy hiking, fishing, shopping, site seeing, rock climbing, horseback riding, white water river rafting, kayaking, mountain biking, cross country skiing, snowboarding, or just relaxing on the deck with a cup of steaming coffee or cooking dinner out on the grill. Our vacation home is surrounded by many wonderful attractions including: Historic Cripple Creek Mining District, Manitou Springs, Pikes Peak, Cave of the Winds, Garden of the Gods, Cheyenne Mountain Zoo, Seven Falls, North Pole Amusement Park, United States Air Force Academy, Florissant Fossil Beds, Manitou Cliff Dwellings, Colorado Wolf and Wildlife Reserve, Mueller State Park, and many other attractions near the Colorado Springs area. This home is perfect for couples, families, honeymooners, nature lovers or anyone just needing to get away from it all and relax in a mountain environment. The area is surrounded by Pine and Aspen trees and has abundant wildlife. As beautiful in the winter as it is in the summer. The cabin has door side parking with minimal walking. The roads in the area are well maintained, but 4 wheel drive is recommended in winter. Our home is professional cleaned before each guest's arrival with fresh linens and towels in place for your convenience. Trash service provided by cleaning crew after your departure. Primary renters must be at least 25 years old or accompanied by an adult. Well behaved dogs considered with owner prior approval, additional fee and veterinary proof of current vaccinations including Parvo. Our family traveled to beautiful Colorado every year for our vacation and loved it so much we decided to purchase our own little piece of Heaven. We would like to share it with others so they can have the same opportunity to experience the same joy we have in the beautiful Rocky Mountains. We sincerely hope you enjoy your stay! We purchased this property primarily because of the absolutely breathtaking mountain views, total privacy and convenient location to many attractions. Relaxing just seems to comes natural in our mountain home with the secluded privacy, beautiful mountain views, and fresh clean mountain air. Yet we are conveniently located near several tourist attractions in the Pikes Peak Region. The wildlife is amazing to watch from the large solar windows. Breathtaking mountain views including view of Pike's Peak. Approximate altitude at property is 9,200 ft.
Baseboard heaters in each room individually controlled. Fresh linens are on beds upon your arrival. Full size front loading washer. Fresh clean towels hung and ready to use. Wrap around deck with beautiful mountain views. Plenty of free on site hiking trails through the forest of pines and aspens. 3 night minimum stay required. Altitude approx. 9200 ft. This was a great getaway for spring break! My 7 year old and my dog loved the snow and the backyard! My husband and I loved the beautiful accommodations, views and the outdoor patio! I also appreciated Sue checking in and problem solving weather related issues!! She was wonderful! This cabin is truly great, clean and well taken care! Great for families and close to everything!! I can’t wait to go back! We loved the cabin. It was comfortable for my family of five. My kids loved the loft bedroom. It was incredibly scenic and we enjoyed the snow. We had plenty of room. We didn’t do much cooking but it was well stocked if you were planning to cook. My family and I stayed in this beautiful mountain home right before Thanksgiving. We were looking for a quiet get a way and this was the perfect place. The views were amazing and it was so much fun to see the mule deer every morning coming up to visit. The owners were so very nice and great at communicating with us. I'd definitely recommend this home for a nice quiet vacation. There was no mobile service so we got to enjoy each others company without being bothered by work, which my son absolutely loved. We definitely hope to return one day. Great place to get away!! The cabin was what we were expecting. It was cozy and clean. It was the perfect place to get away from the everyday hustle and bustle. We enjoyed visiting Eleven Mile Canyon while we were there. The Views from the deck were amazing. Great getaway, house is as described. Quiet, clean, and close to the attractions we wanted! Wildlife, great Oct weather, changing colors, enjoyed Chiefs beating Denver, used the grill, visited 11-mile Canyon, CO Springs, and Cripple Creek! Altitude at cabin is approx. 9,200 feet. On site hiking. Grocery and gas 8 miles. White water river rafting, local cross country skiing within driving distance. Downhill skiing at Breckenridge is an 80 miles drive. We require a signed copy of the rental agreement returned to us either scanned and sent via this email or you can return it to us by mail if you do not have a way to scan it. Well behaved, house trained dogs considered with owner pre approval and proof of veterinary vaccinations including Parvo. and a $25 one time pet fee per dog with owner preapproval. 3 night minimum stay except Holidays which require one week minimum.